Erin Klassen is a writer and collaborator in Toronto. Her brand, With/out Pretend, is an independent Toronto-based publisher that is focused on producing, promoting and distributing works by emerging female writers and visual artists, including those who identify as femme, queer, trans and persons of colour. For Erin, her favourite things to talk about include feelings, human relationships and the future. With/out Pretend’s debut collection of short stories, PORTRAITS, is available now. In 2015, Erin released a prezine called Things I Do When I Feel Blue. On Wednesday, November 16, With/out Pretend launched their second book You Care Too Much, which you can order right now. We caught up with Erin to learn more about the With/out Pretend story and how we can all get our hands on the publishing company’s next book. 1. On the With/out Pretend website, simply placed on the homepage is a description of what your brand is all about. No clicks. No tricks! Just the facts. Who designed your website? What’s the hardest part about web design? My branding and logo was designed by Kait Souch and Tanya Santos. I’ve kept the site simple because what we do is pretty simple. Really the brand is meant to lead you to the books we create and publish. 2. What was the inspiration behind With/out Pretend? I wanted to write stories and make books, and I was also interested in collaborating with a community of female artists on projects that were different, a little offbeat. I didn’t know the first thing about publishing, but thought I could try it anyway. For once in my life I didn’t spend time over-thinking the pros and cons and I decided to go for it. So that’s what With/out Pretend is about for me, and why the name is fitting for the way I feel about being a maker, a woman, a human. We all live with and without pretend, don’t we? There needs to be a balance of cultivated, practiced confidence and a willingness to embrace vulnerability. The work I’m doing for myself and with others is helping me to worry less about who I am “supposed to be,” and spend more time focused on learning (and becoming comfortable) about who I actually am. 3. Where did the name come from? The name was inspired by a Wye Oak lyric. The line is actually “I am nothing without pretend,” and I thought, how beautiful and how sad and how true for so many of us. 4. Did you always know you wanted to spearhead your own company/brand? I’m entrepreneurial by nature, for sure. I’ve always liked building things from nothing, being the person who makes something happen. Especially when that means I can bring other folks along for the ride. I like creating opportunities. 5. What about producing, promoting and distributing work by emerging female creators is important to you? Confidence, opportunity and support are the three things holding back so many talented women. We need to lift each other up. There are so many old systems and old ways of thinking we have to push through and work around—as women and as makers of things. That’s why I’ll never have an exclusivity clause for the artists I work with, or ask them to give me ownership of their work. It’s hard enough out there without extra red tape or unnecessary competition. I believe there’s enough demand for thoughtful, unpretentious work that we shouldn’t need to feel threatened by each other. Plus, I find women endlessly interesting. They have so much to say, there are infinite layers. So selfishly, I’m asking women to be a part of my projects because I want to work with them and be in the front row to watch them do their thing, make interesting work. I feel privileged to have the time and resources and ability to build this company as a personal project, because I have the luxury of focusing on these values, and I can measure success in ways aside from profit. I realize that this luxury isn’t possible for many, so I’m happy to be one of the people who creates the space, waves my hands in the air, encourages folks to take a risk, and supports them through the not always straightforward process. **Note: important that when I say female I’m referring to any folks who identify as women, including trans women. 6. Your branding is very inclusive! We need more companies and organizations like this around! Why is including people who identify as femme, queer, trans and persons of colour in your brand so important to With/out Pretend and to you, personally? That’s an easy one for me. The only true community is an inclusive community. Plus, how boring would it be to tell and retell the same stories from the same women, with the same general perspective? Yawn. 7. Your debut work of micro fiction, PORTRAITS, is available online. It’s full of 40 short stories, paired with visual art by one of five different female artists. If you could choose one story from this group of 40 to read over and over again, what would it be? Why? Some of the stories were directly inspired by my real life, by my own past relationships, and the others are creatively interpreted stories of real women I interviewed for the book. I think my favourite one is called “You Bring Out the Worst in Me” because it’s the story that gave me the idea for the book. I was inspired by the dozens of draft e-mails I’ve written to exes over the years—letters I will never actually send but that feel really good to write as you fall deeper into the cyclical madness of ending something with a lover/partner/Tinder-date. I wondered if other women did this too and then when I asked some of them, it was clear there was a whole book of stories there. 8. What is your favourite book to read right now? Why? I’m obsessed with books, so this is an impossible question for me. I have a close friend who gave me the brilliant advice to read the books I need, not just the ones that speak to the themes that already exist in me—she told me to start creating reading lists as a prescription, a cure for the things I’m searching to learn about myself. So on that list, there are some masculine energies to tap into, specifically DFW and Bukowski. But my true blue bedside stack includes works by Anais Nin, Anne Sexton, Alice Walker, Virginia Woolf and Simone De Beauvoir—these are my go-to friends. As far as more modern books: Sheila Heti wrote my favourite book of the last decade, How Should A Person Be, and it’s extra special because my best friend gave it to me. 9. What is the life of Erin Klassen like? What do you do when you’re not working on With/out Pretend? I work at Etsy by day—I manage our Community Programs and Partnerships team for Canada and it’s such a dream job because I get to meet so many inspiring artists and craftspeople and travel all over Canada. Last year I got to go to Nunavut to work with Inuit artists! Other than that, I love eating and drinking wine and listening to records and having very long conversations on my couch with good friends. 10. There are many non-profit and activist groups emerging that support the people you celebrate through writing and art. Is there any particular group of this nature that is close to your heart? Why? Shameless Magazine is an amazing publication for girls and trans youth—but it’s also for grown ups who didn’t have the opportunity to read it when we were still “youth.” I’m the co-founder of a fundraising group that we started in memory of my brother Nick, who died seven years ago, and each year around the anniversary of his death we host an event and raise money for a different organization. This year we’re raising money for ArtHeart that provides free art programs for youth in the Regent Park area. I agree, there are so many amazing groups that do good work—kindness is everywhere. 11. With/out Pretend is active on Etsy! What about this online shopping site helps your brand grow and prosper? I’m partial to Etsy as a platform for creatives to sell their work, but not just because I work there. Etsy sellers were actually the ones who gave me the courage to start my own publishing company, and to start writing again. I’ve met so many incredible people who are bravely making things that matter to them, because they want to make a good life, one where they can turn “work” into something they’re passionate about. I’ve had some pretty great customer experiences through Etsy so far with total strangers from the US and Australia, even, finding PORTRAITS. 12. With/out Pretend also has an Instagram profile. What about this platform is so important to your brand? Honestly, I’m not very savvy at social media. I love Instagram because it can be a very simple way to stay connected with like-minded people. I try not to take that part of my work too seriously because in the end it’s just a vehicle for the message. On the other hand it feels pretty great when someone I don’t know has read PORTRAITS and tags me on Instagram to share how they connected to one of the stories. 13. Why is With/out Pretend not active on Facebook, Twitter or Pinterest? We’re really just getting started, so I imagine we’ll spread out across the Internet once we grow! I can’t say I’ve ever taken to Twitter though—brevity isn’t exactly a quality I possess. 14. What is the toughest lesson you’ve learned since you started on this creative journey? I’m not sure it’s a tough lesson, but it is the most important one: I need to trust my gut. 15. Sometimes, it can be hard to find inspiration and motivation when working on any task – even creative ones! Where do you go to find inspiration? Or, who do you talk to? Why? I’m most inspired to start projects when it’s an idea that includes other people, and I do my best work when I’m collaborating with talented women, because I’m motivated to earn/keep their trust. For writing, though, it’s more a process of searching for answers and unjumbling my strong feelings. It feels more messy than beautiful, more manic than method. 16. If there’s anything you hope our readers take away from this today, what do you want it to be? The cover of With/out Pretend’s second book. Cover photo by Angela Lewis and design by Jen Spinner. Photo courtesy of: Erin Klassen. The inner cover of “You Care Too Much.” Photo courtesy of: Erin Klassen. 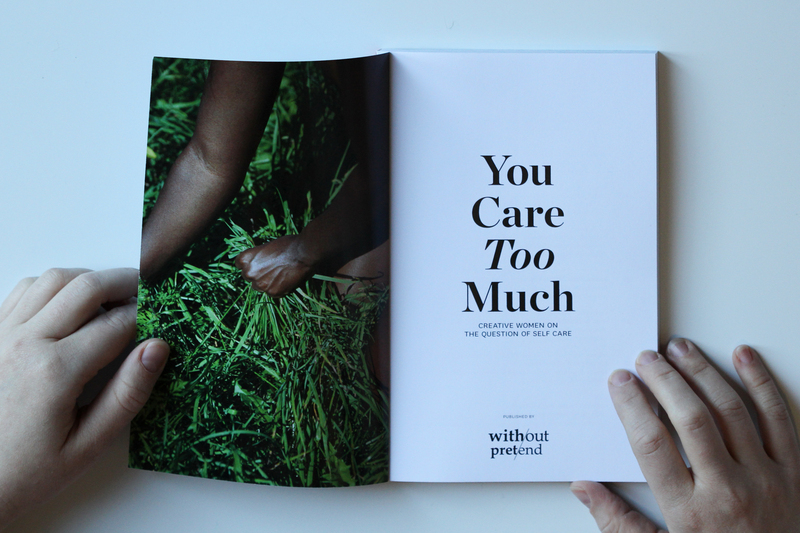 I’m extremely excited about our next book, You Care Too Much, which launches November 16. It’s a collection on “The Question of Self Care,” of confessionals, poetry, fiction, art and photography by seventeen female contributors including Winnie Truong, Leah Horlick, Tallulah Fontaine, Angela Lewis, Mo Handahu and Anabela Piersol—to name just a few. I think it’s a really unique kind of collection and I can’t wait to share it. We’re hosting a launch party in Toronto on Wednesday, November 23—which also happens to be my birthday! I can’t think of a better way to celebrate. For more information about the You Care Too Much launch party on Wednesday, November 23, visit www.withoutpretend.com.